Hooked on Needles: Red and Aqua Quilt ~ Finished At Last! Finished at last! And I must say, I love it! 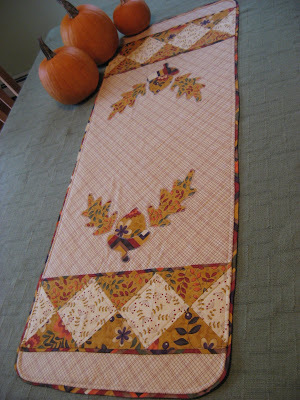 You might recall when this project began...way back in October, 2009, when I made my blocks for this swap. It was one of the first swaps I joined, and I was so skeptical about the color combination! Silly me! My mother would love this fabric. She has a thing, I mean a real thing, for red and white! And there's that fabulously happy Plain Jane fabric that I had my eye on from the very beginning to use as the backing for this quilt. It's a Michael Miller fabric and I think I read recently that it has been produced again. 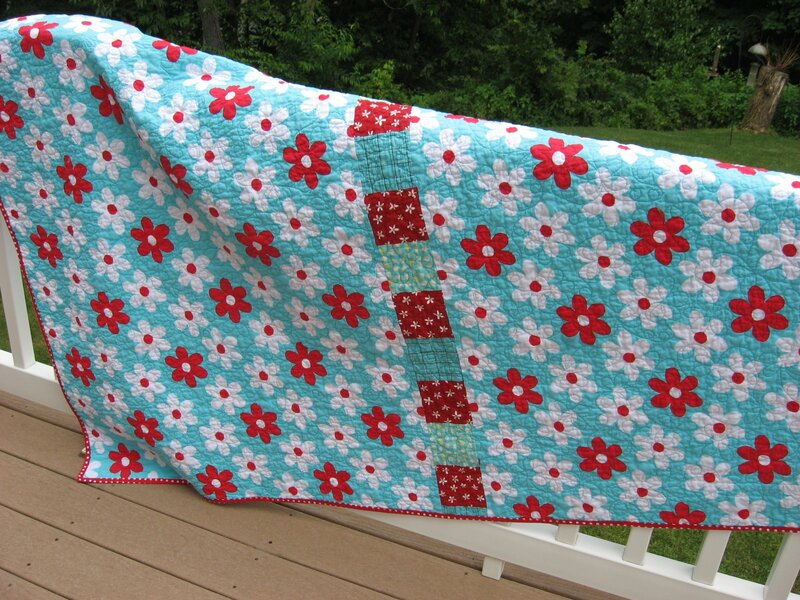 When I bought it, it was a lucky find to get all the yardage I needed in one piece! 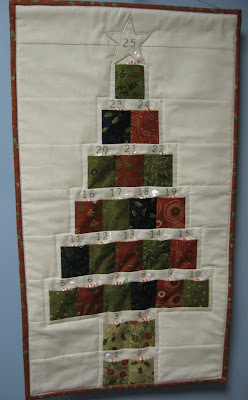 I love piecing extra blocks into the backing of a quilt, and this one worked out perfectly. Had I not pieced this strip in between two widths of the Plain Jane fabric, I would not have had enough width for the backing to work on the long arm machine. 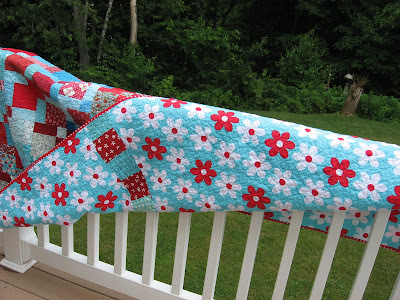 So having those extra blocks saved me from having to purchase another length of the backing fabric! 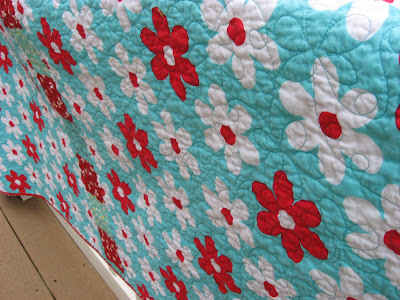 See my little improv quilting there? I wanted to try doing extra loops in one of the daisies while I was quilting, which you can see in the upper left side of the quilt in the picture above. 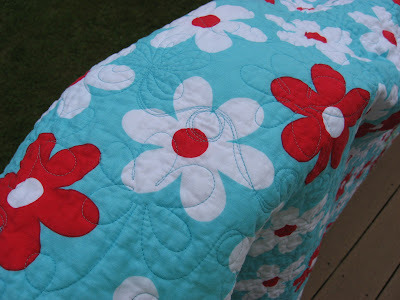 But when I came out of the flower, I went in the wrong direction for a bit and had to quilt my way back to the flower to continue in the right direction! No one can ever accuse me of being perfect! 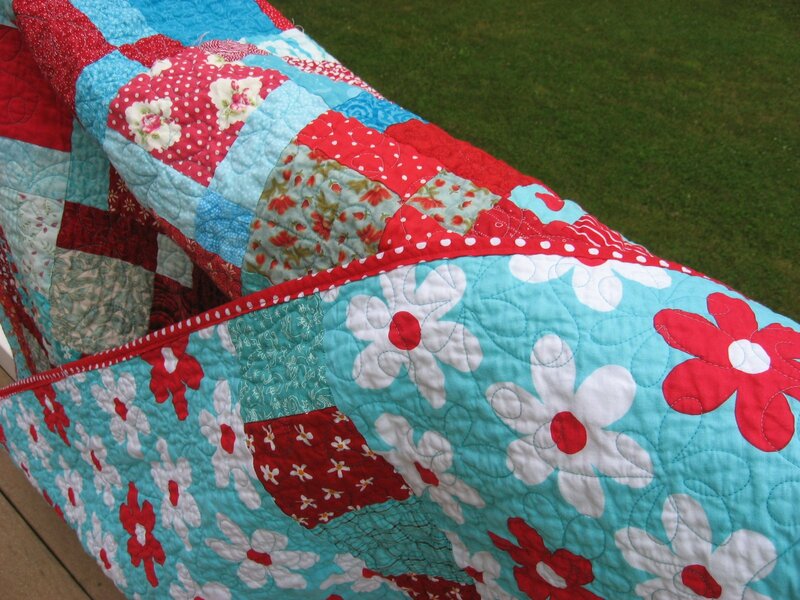 Don't you just love how crinkly quilts get after being washed? I sure do! And check out how white those white flowers are. 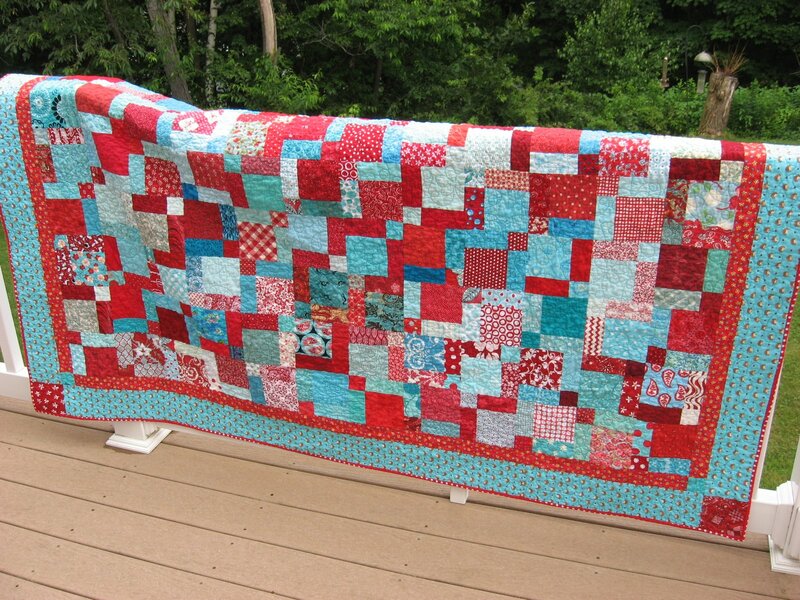 When I washed this quilt, I threw in some color catchers just to be safe. 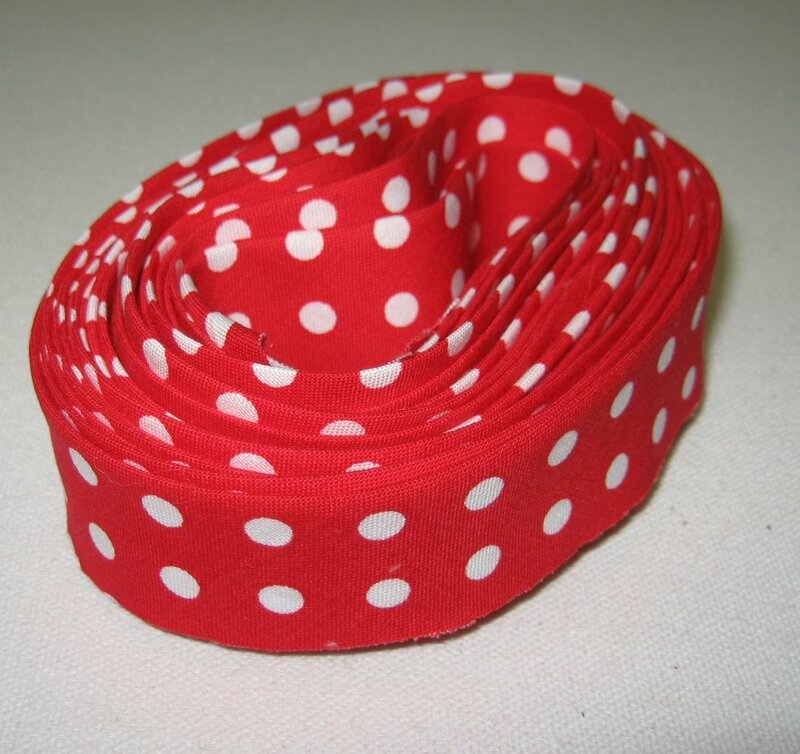 You know how red fabrics can be! The quilt came out perfect, and the color catchers came out a lovely deep shade of pink! They are definitely worth the investment! My next sewing project is making this skirt from Moda Bake Shop using Lucy's Crab Shack fabrics leftover from two tote bags I just finished. My little Gracie is so excited about it! Pictures of both projects to come! Beautiful quilt -love the colors! LOVE this!!! So pretty and the white is magnificent! That skirt is going to be a hit!! It turned out wonderful! I love what you did to the back. Super smart idea. And yes, that just out of the dryer feel so yummy! Great job!! It looks fabulous! 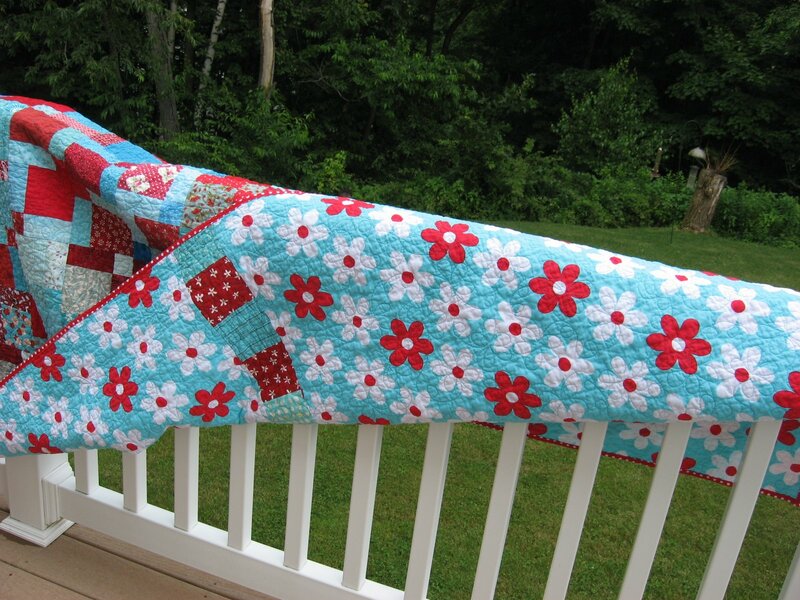 Congrats on finishing this lovely quilt! I was in the swap too and love my finished quilt. Your backing is perfect!